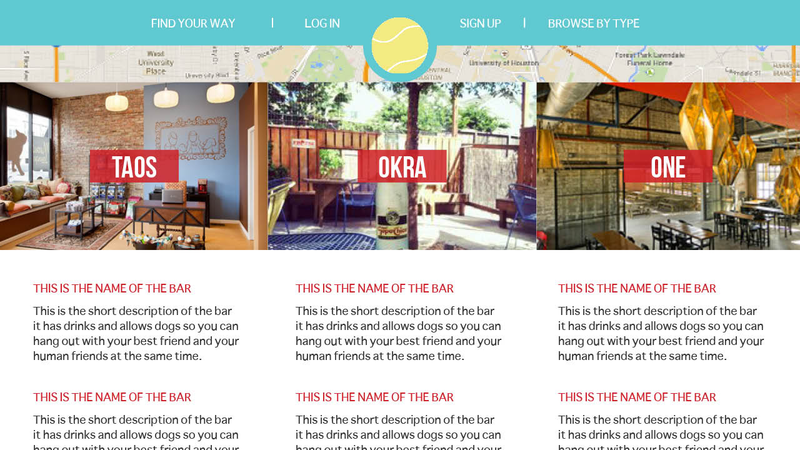 Fetch is a mobile-friendly web app I designed and built to find dog-friendly places nearby. Being able to live my life with my dog is very important to me, and I usually have to go through a lot of hassle to find out if a place is dog-friendly. 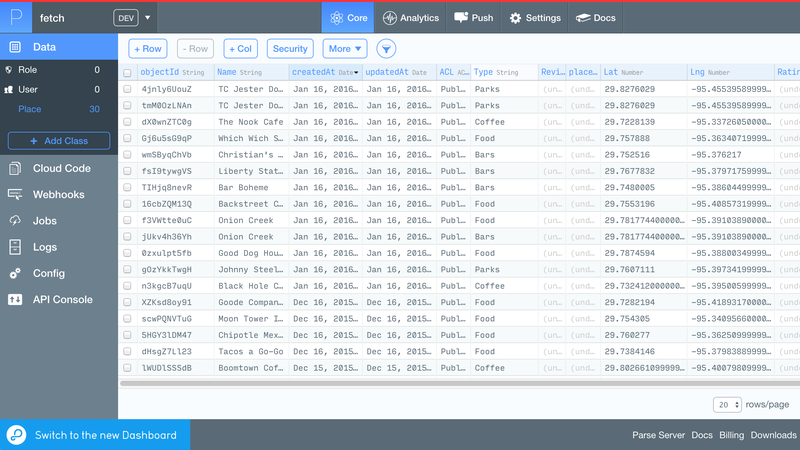 Fetch uses a database of locations – bars, cafes, parks, etc – that allow your canine best friend, created through user input. People can upload new places they find with their dogs so others can enjoy even more canine companionship in their own lives. 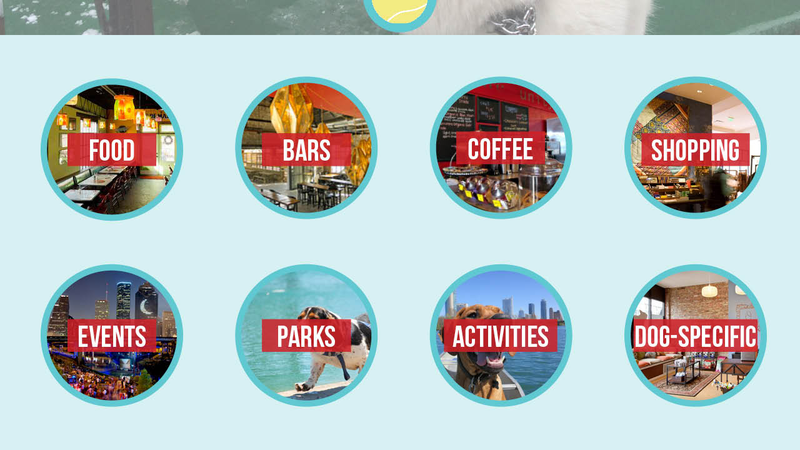 Fetch fills a niche in the market – an easy way to find dog-friendly places. Rather than calling ahead or finding out the hard way, people can use Fetch to easily know whether or not their furry bestie can come. My own frustrations led me to design Fetch, and conversations and user-testing with other dog parent friends confirm its potential. 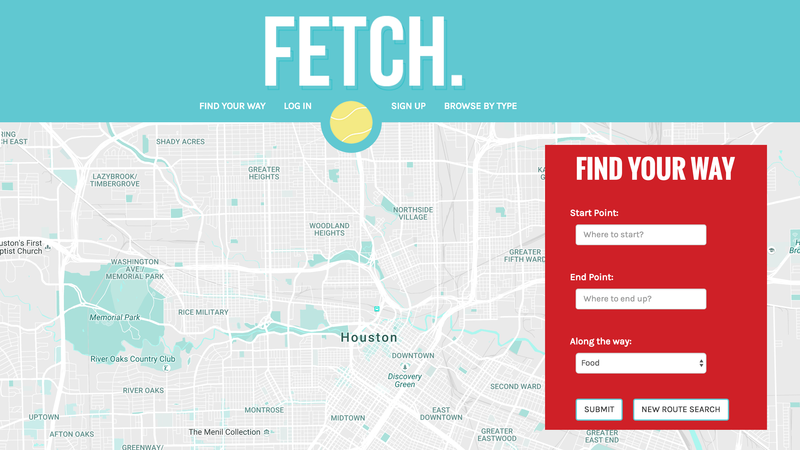 Fetch uses user-input to compile a database of dog-friendly locations and categorize them – food, coffee, parks, shops, bars, and doggie stores – for other dog parents. User-input allows for unofficial and occasional dog-friendly zones as well as the officially designated places to be known and available. 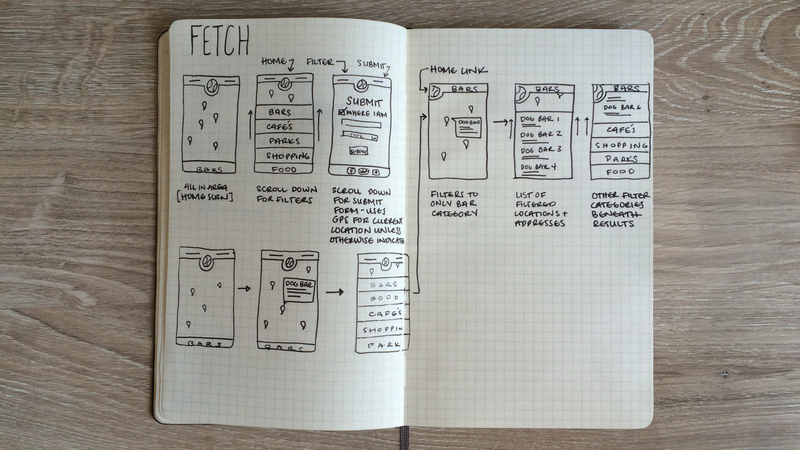 Fetch is a mobile-friendly web-app that utilizes Parse to form a categorized database. The app grabs each user's location and offers dog-friendly establishments nearby from that database, and gives the opportunity to submit new places as they are found. User testing, user testing, user testing. Fetch has gone through several iterations, and been streamlined at each stage based on feedback from both individual and group testing sessions. First, I mapped out the types of dog-friendly places people might want to visit with their furry best friends, and used them as data filters: Food, Bars, Coffee, Parks, Shopping, and specifically pet-places, like pet stores or groomers. 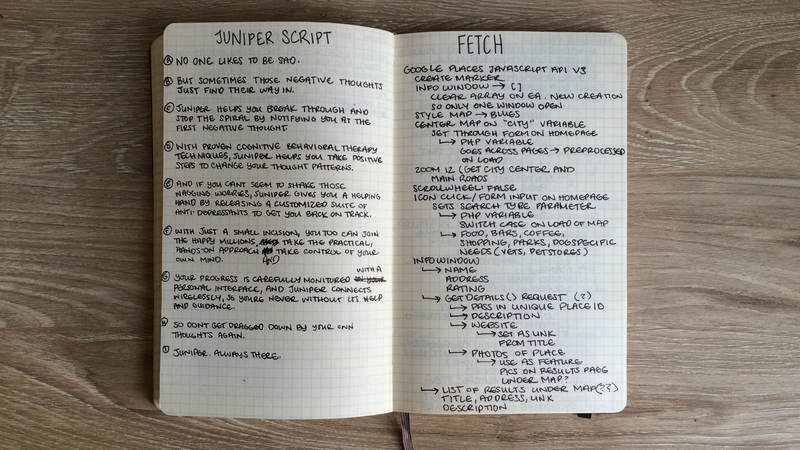 I also brainstormed on what features dog owners might want from a site like Fetch. Membership and favorites? A way to rate the suggested places once visited? Reviews? 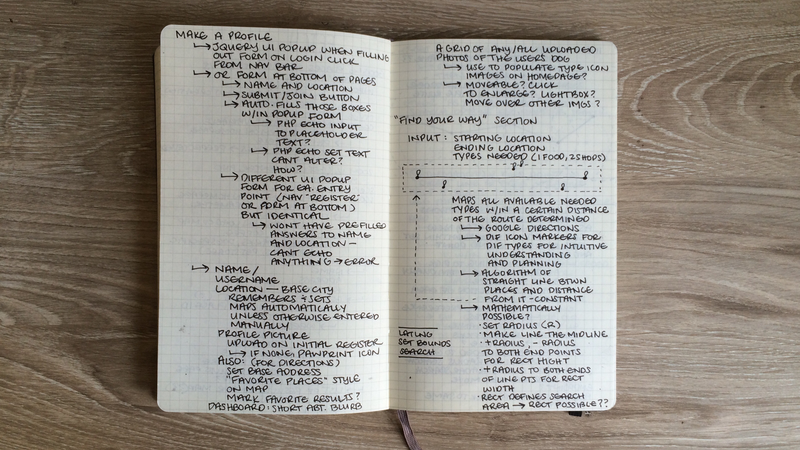 Or route planners for an entire day with your dog? In the first iteration, the project parameters were such that a membership aspect was foremost in importance, theoretically to support saving favorites and writing reviews. However upon completing that project membership took a back seat to the actual point of the app – creating a reliable, streamlined way for people to find dog-friendly places near them. As this app would be the most useful while on the go – and therefore on users' phones, I designed a very simple interface and user experience, mobile-first. The mobile version has maintained this streamlined user flow throughout multiple iterations, as the desktop version received and subsequently lost several unnecessary bells and whistles. As Google Places sometimes notes whether or not an establishment is dog-friendly, I initially attempted to use their API to mine the locations. While it did work, and the locations were indeed able to be categorized, the results were... often unhelpful. Known dog-friendly coffee houses and bars were left out, unmarked in Google as "allows dogs." And, more ridiculously, results for hot dogs were continuously brought up despite all efforts to cull them. Not the same kind of dog. 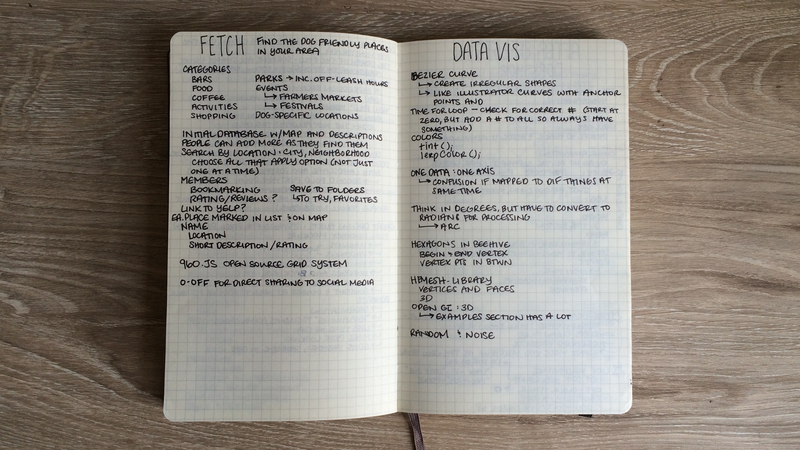 The layers of information gathering – such as entering a location rather than the app simply using the user's GPS, further complicated the first version of Fetch. 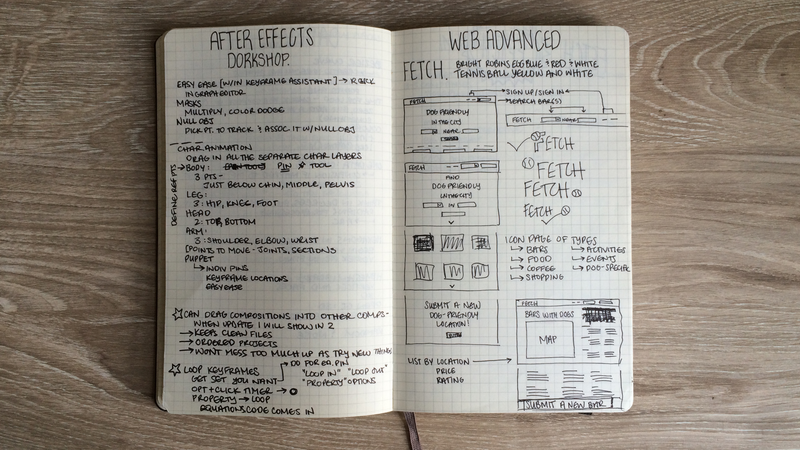 While the initial group of user testing indicated the need for the app in general, there was a lot of good feedback on where I should focus my time and energy in developing Fetch, and the latest version takes all of this into account. 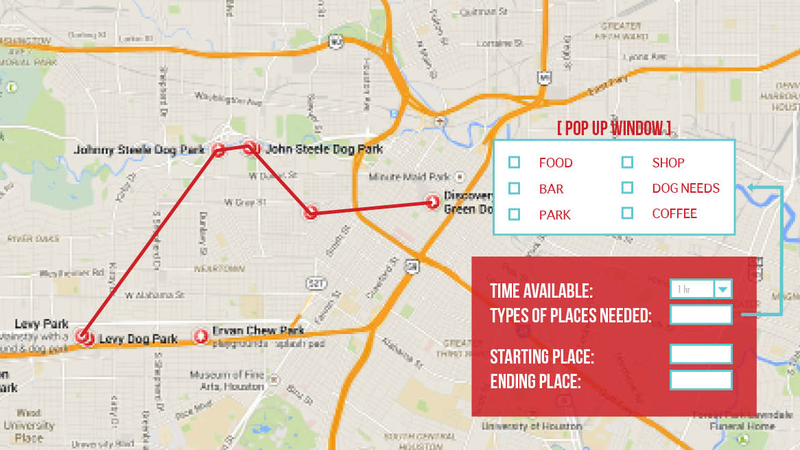 Besides using the Google Places API for dog-friendly establishments, the first iteration of Fetch had the option to plan an entire day's outing with a dog – with multiple destinations along the way. 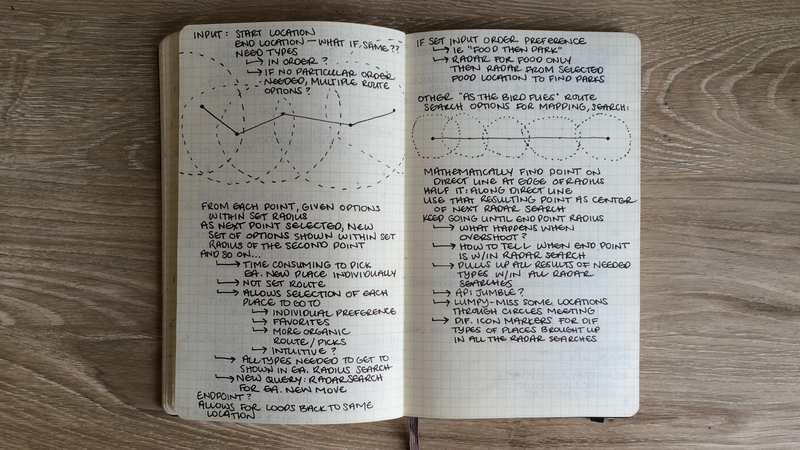 I explored several theories and strategies for creating this route map, and ended with a simple border-box constricting the search along a pathway. However, user testing found this unnecessary and distracting, so it was cut from the present prototype. The map, now, is first and foremost. Upon opening the app, all the dog-friendly locations nearby are already loaded and mapped for your browsing. Further filtration is offered by the category tags at the side of the screen – reflecting the clean and simple filtration buttons underneath the map in the mobile version. 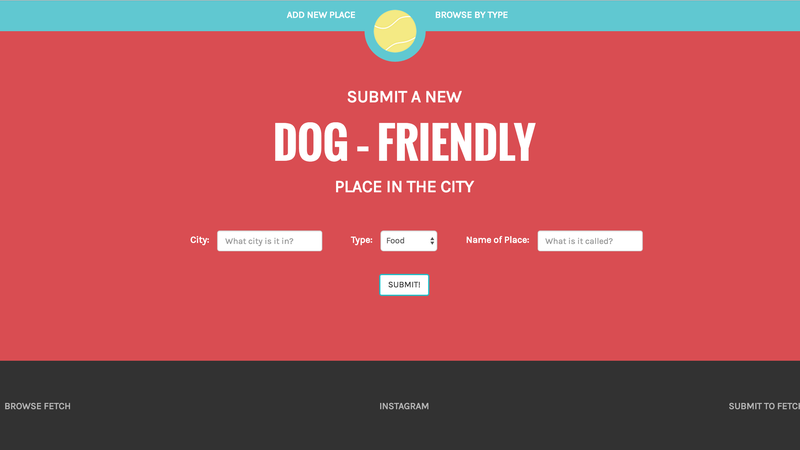 Rather than use Google Places for the database of dog-friendly locations, a user-generated database provides the source material for Fetch now. Though slower to begin, once populated the separate database is far more reliable and easy to regulate. The Google Places API is still used for mapping purposes, however. Each location is categorized for Fetch, then searched in the Google API and stored to the Fetch database with accompanying location data upon submission. Then it is again run through the API and mapped to the resident google map when its category is requested. Submission information is also streamlined by this entry process, as simply a name is required, as well as an accompanying category for use in Fetch. From testing the app, more features need to be added for a more seamless user experience, such as a way to flag potentially erroneous entries for verification. Dog-specific notes and reviews on the included locations would also be helpful – if a place only has outdoor patio space for pups, or if it's only on certain days or times. Also, since Parse is dying, I will need to create a new database and migrate the current submissions for future use. And perhaps create a new, less unweildy world for "dog-friendly locations" as it can get quite clunky with repeated use.